This 18k Gold Plated Swarovski Crystal Heart Shaped Four Leaf Clover Pendant Necklace is currently selling for just $19.95 on Amazon.com! 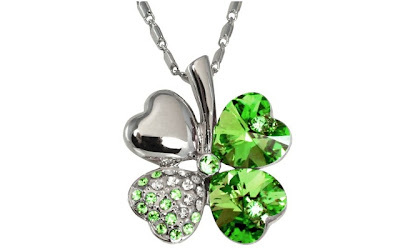 You will be saving 66% off the listed price of $57.95 with this jewelry deal. You have 4 colors to choose from . . . Peridot Green, Amethyst Purple, Aquamarine Blue, and Pink Sapphire. What a great gift for someone who could use a little luck! This item is eligible for Free Shipping on Amazon with a qualified $25 purchase or an Amazon Prime membership. This price is valid for a limited time only, so do not wait too long to take advantage of this discounted price. See all the Fashion For Less deals I've shared for more discounted jewelry, handbags, shoes, and clothing.